We often use the intensity and quality of colour as an indicator of wine style, even before we’ve tasted the wine! It usually holds true for wines at either end of the spectrum, but can be less of a “value”in between. The tinge at the edge of the glass is most often related to the pH of young wine as stated previously. This alone is also a good cue for wine style. A purple/blue-tinged wine has a higher pH than a bright red one. This is explained by the different reversible equilibria that the different forms of free anthocyanins are involved in (4). I am not so sure if the same holds for anthocyanins in complexes, but please correct me if you have more up to date detail about that handy. High-pH wines are often, but not always, made from late harvest, over-ripe grapes, since grapes loose malic acid as the season progresses, and the concentration of potassium increases due to a loss of water near the end of maturity. Of course, in Australia we can just add a a couple of bags of acid to the must and correct it, but such additions, although often necessary in order to make well-balanced wines, can easily be overdone if we consider analytical results only! Thus, the purple-edged wines are most likely big and fat, whilst the bright red ones are acid and tart? Not always, but often towards those two alternatives. At least in countries where acid additions aren’t allowed! The figure below illustrates clearly the effect of pH on the perceived colour of anthocyanins. 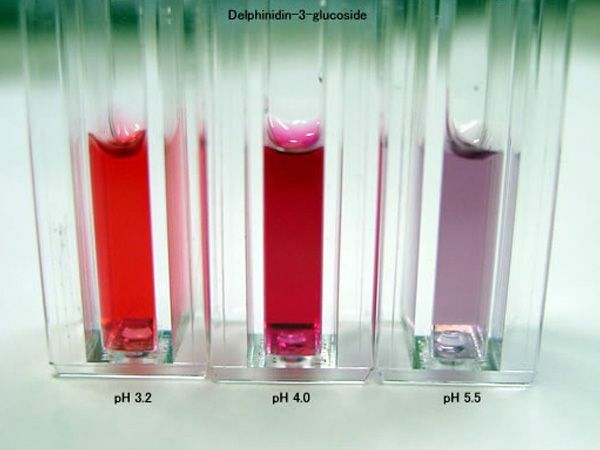 All solutions contain the same concentration of the same anthocyanin, namely delphinidin-3-glucoside. The only difference is the pH (and the buffer used to achieve the pH differences). The concentration is not very high and at a high concentration of anthocyanins, all solutions will appear black, except at the edge! Older wines have more of a brick-red/yellow hue than young wines. Phenolics oxidize and this irreversible oxidation is merely a function of time and environment. Such reactions are enhanced by the presence of light, high temperature and oxygen that has migrated through the cork (which is why Stelvin-capped bottles will appear fresher for a much longer time, they don’t allow as much oxygen to reach the wine!). Winemakers who gamble with the addition of low amounts of sulphur dioxide will also suffer, for sulphur dioxide does just that, protects the wine from the effects of oxygen by binding to it with great agility and speed before it can do any harm! Until I get a chance to revise further, please don’t hesitate to ask any questions or to point out obvious faults! (Patrik, 17th of September, 2002). Unlike wine, old references seldom age gracefully. Only the best survive, and poor access to old ones in this modern internet-dominated age will make even old classics easily forgotten. My stock of anthocyanin-related references is clearly outdated, so if you find a nice, new, fresh and exciting paper, please send it to me!